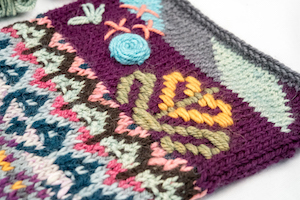 In this class, students will learn the basics of stranded color work, including reading charts and properly blocking your work. In class, students will make a sampler illustrating many regional styles of colorwork: Fair Isle, Selbu, Setesdal, and even Bohus knitting. Less familiar techniques like embroidery, intarsia, and roositud will also be covered. We’ll also cover two-handed color work, tacking long floats, proper tension, and choosing colors for optimal effect. Students will be provided with worsted-weight yarn in a range of gorgeous colors from The Fibre Co.